I have been reading almost for as long as I can remember; before that my parents read to me every night. I have devoured stories, admired language, marvelled at plots, loved characters, hated characters, gotten lost in worlds, lived exciting lives, seen wonders, wondered what would happen, cried, laughed, (yawned,) felt all manner of feelings and always, always wanted more. When I was younger I would lie awake, reading with one hand on the light switch, having perfected a technique of closing the book, turning out the light and lying down in bed in one motion in case my parents came to check that I was asleep. I read while I walk, on the bus, on a plane, and sometimes even while knitting. I studied literature, teach literature, read every day. It is an absolutely fundamental part of my life, central to my identity (both in that I see myself as someone who reads and in that what I have read has shaped how I see the world), and something I cannot imagine not wanting to do. I love the feeling of making my brain meet something new as much as the comfortable (safe) feeling of rereading. I read fiction and fact and that something in between. And I read (as I've stated before) a bit like a kid in a candy store (with no sense that one should finish one book before one starts a new one, and always with 30-something books on the go); but never giving up on a book without having finished it. But this is not why I call myself a bibliophile. Not quite, at any rate. There is more to it. 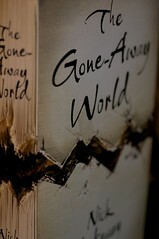 I love the book. Or books. Books are more than just text. The smell and feel of them cannot be replicated digitally. Nor their history as objects. I was attempting to convey why e-books simply cannot replace ordinary books. I thought I did a very good job of being concise. 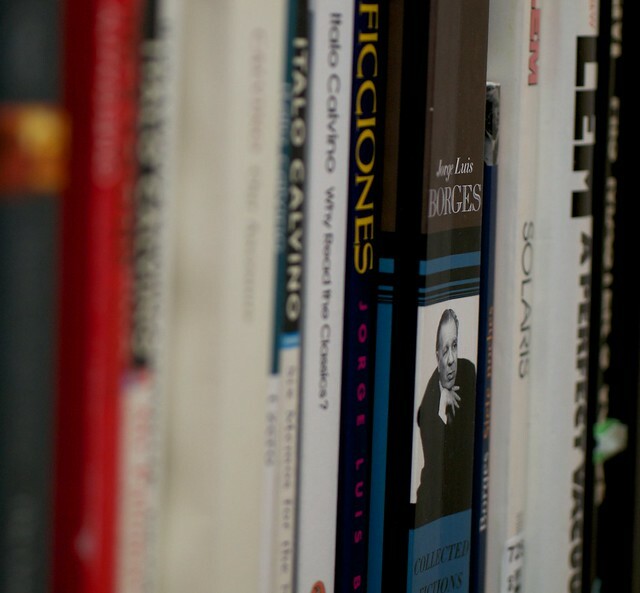 Digital books are not better or worse, just different, with other qualities. Civilized people should have plenty of both! At which point I realised that I needed to elaborate, and that this was one of the many instances when 140 characters would simply not be sufficient (nor 560, or even 980). And so here we are. You see, I don't agree that they are neither better nor worse. Not quite. Yes, there are things e-books can do that paper cannot. And this is good. They are searchable (which, even with an excellent index and the best will in the world, an ordinary book is not). They allow the reader easier access to a sort of rhizomatic, almost tangible intertextuality which can (ideally) take you from place to place and back again. Yes. Definitely. And yes, you can carry thousands of them around in your pocket. (And you can knit quite easily while reading them, using only your little finger to turn the page -- all good.) This is not about me hating e-books. I do not, nor do I think I ever can, love e-books. And I do love the tangible, smelly, bulky paper-and-ink type. 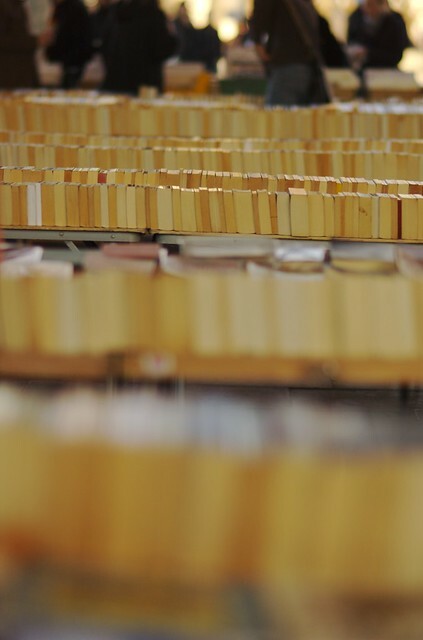 Can a digital e-book shop ever give you the sense of wonder and promise and possibility which walking into the book market on the Embankment does, when you see row upon row of books, each one a separate object, visible but still not identified? There are shapes, colours, but not yet titles. Sunday Book Market, Embankment, London. Or the feeling of being surrounded by books, books and more books, which any decent independent bookshop should (and certainly every purveyor or second-hand books I have ever entered does) provide, physically surrounding you with deliciousness? There are many things an e-book cannot do. One of these is lie around in row upon row (or stand around on shelf upon shelf) and be visible and promising. Browsing an iBook store, with its naked titles listed like so many homogenous entries, simply will not do. Texts are exciting. Texts are fun. And I realise that when I talk about reading, about loving characters, plots, language, I am talking about the experience of texts. And e-books can reproduce texts. The exploits of d'Artagnan (and, more importantly, the dashing figure of Athos) are accessible to me as an iBook. But the book as an object is not. If you are currently thinking about the irony of my trying to communicate the bookness of books through a digital medium, it is not lost on me. Nor the difficulty of the enterprise. What I would like to do is drag you to my bookshelf and give you a book to hold, feel and smell. Because, quite apart from the text they contain, books contribute to the reading experience. Holding a small book is different from holding a large book. Folding a paperback around itself is an entirely different experience from using both hands (and your lap) to support a giant hardback. A paperback from Penguin, printed in 2012, will provide an entirely different tactile experience than this leather-bound edition from 1928 (you have no idea how soft that leather is). 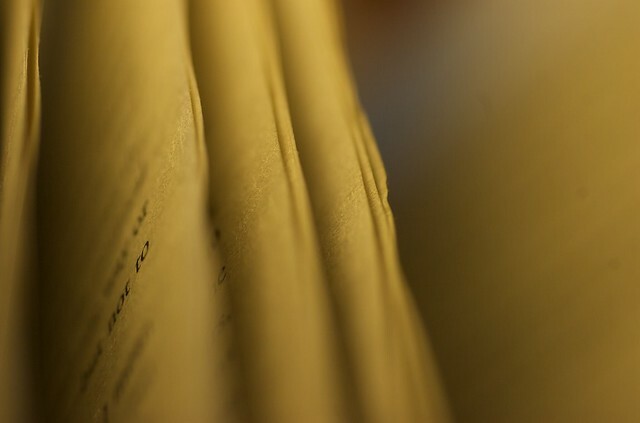 The rustle of thin paper, the rougher feel of thicker, lower grade paper, the yellowing of pages as the book ages, none of this is available in an e-book. Yet it is part of the experience of reading: I can remember how the book felt in my hand when I think about what happened in the text. I can feel where in the book a scene occurred, when trying to find it again later, because my fingers remember how thick one side of it felt in my hands. An e-book always feels the same: like the cold plastic or metal or glass that you use as its container. It feels no different whether you are at the beginning or the end of the work. 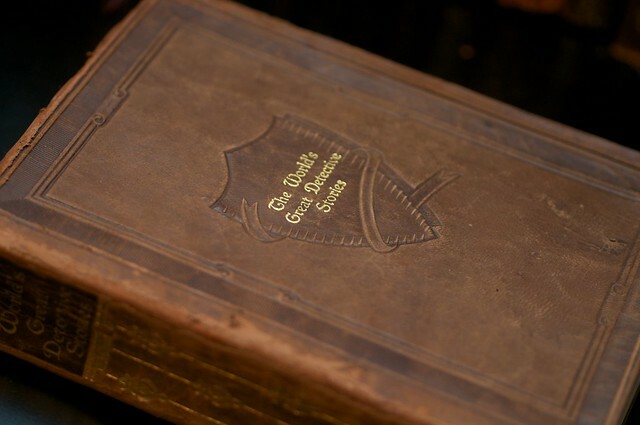 It makes no sound as you turn the pages, it does not give in your hands or resist your handling of it. It is entirely passive and expressionless. That is not quite true. The e-book presents itself as pure text, but the Kindle or iPad or whathaveyou is also a material object. It is just a material object with no sense of what it is displaying, no idiosyncrasy. And it lacks what to me is perhaps the most important experience of the book while reading: its smell. I love the smell of books. 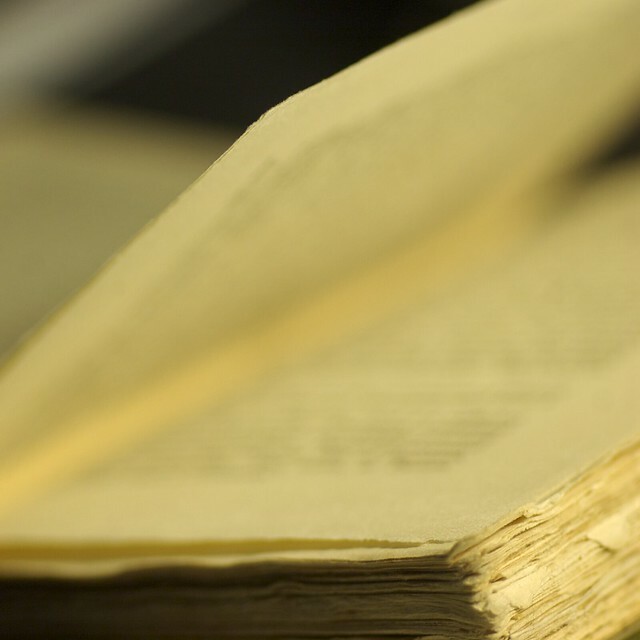 It has been suggested to me that some sort of fungal hallucinogens could be involved, but I suspect the pleasure I feel when smelling books is primarily due to my brain having registered that reading is fun, and that reading is connected to this smell. Or maybe they just have a wonderful smell. You know the smell I mean: slightly earthy, a little musty, dry, delightful. 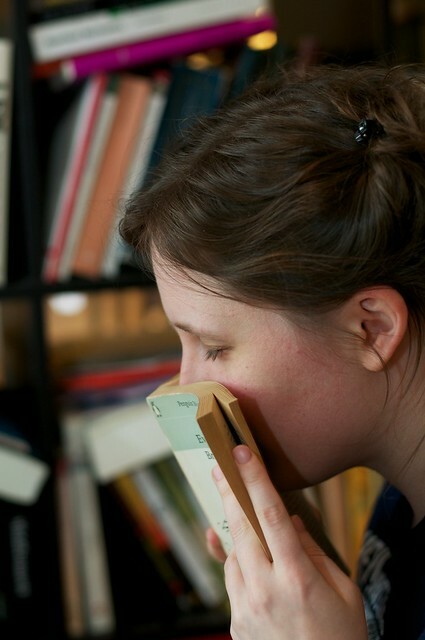 Not all books smell the same. But some carry you off on a cloud of olfactory delight and have their wicked way with you. Books, moreover, are beautiful. I grant you, not all books attain the same level of beauty (a bit like people, I suppose); but even ugly books contribute to a marvellous heterogeneity (bookshelves should not consist of row upon row of identical books). All texts are of course different, all novels use language in different ways; but the book as an object reflects this, even contributes to it in providing a variety of editions, covers shapes and sizes of the same (or similar) text(s). I bought the bottom one first. I was 14 years old and had just seen the BBC adaptation. 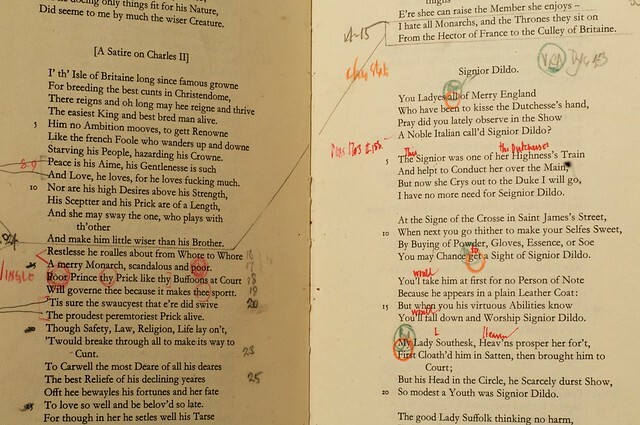 I bought the black Penguin Classics edition in Shakespeare & Co in Paris eight years later. 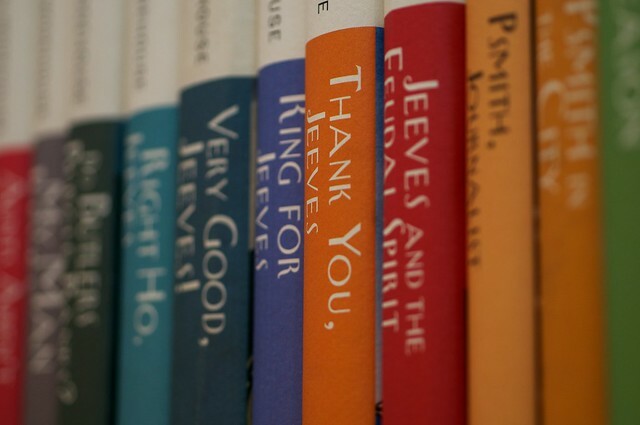 And the leather bound collected works in a wonderfully overstocked shop in Hampstead last year. I keep buying new editions, not because they break and fall apart (although one or two of them have been in danger of that), but because they are all distinct, different, not the same. The experience of reading one is not identical to that of reading another. Wrapping matters. I started reading this book before I had even opened it. It is the most obvious illustration of what I always do: I begin to form my impression of the text based on the book as an object. It helps shape the images in my head and the atmosphere of the novel. E-books have covers. I have seen them. Mostly, I have seen them as tiny thumbnails (smaller than my thumbnail) next to the title in a list. These are token images, illustrations. Once you have started reading the book, the cover is gone; when you put it down, you see the technological doodad you are using (which always looks the same), not the particular, distinct book. I love sitting on a bus or a plane or a café, trying to guess what some stranger is reading by catching a glimpse of the dust jacket of their book, or even the title. The extension of this is of course an elaborate game of trying to match book, appearance and demeanour, and to spin an idea of how that person might be. E-books are no fun: no matter what someone is reading, the back of the technological doodad looks the same. All they tell you is that you are dealing with someone who would rather read something from a device with no personality than from a book (with its own smell, appearance and tactility). 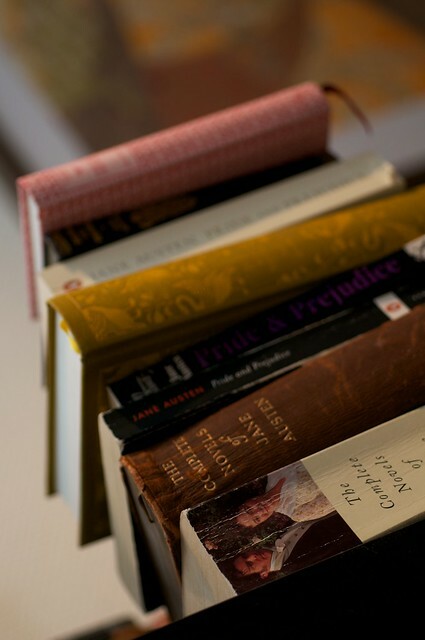 Books as objects, moreover, can be placed on shelves in rooms. In what is perhaps an extension of this looking at people's books in cafés, I generally gravitate towards the bookshelf when visiting a new house. This isn't a conscious attempt to put my hosts in a box, or to judge them in some way. I think it is founded in a combination of social insecurity (we need something to talk about), a love of books (let's see which ones they have) and, yes, this attempt to form an impression (not just from which books are there, but also how they are organised). I am always a little unsettled when entering a house without a bookshelf. In part because it keeps me from this navigation. The idea that even people who love to read might develop bookshelfless houses is not a happy one. Looking through someone's reading device is a much less socially acceptable thing to do. Bookshelves are not just important in other people's houses, of course. It is one of the principal forms of decoration in ours. I am not a fan of useless trinkets and china figurines, and while we've got art on our walls and plants and suchlike, the house would look empty and sad without the books. 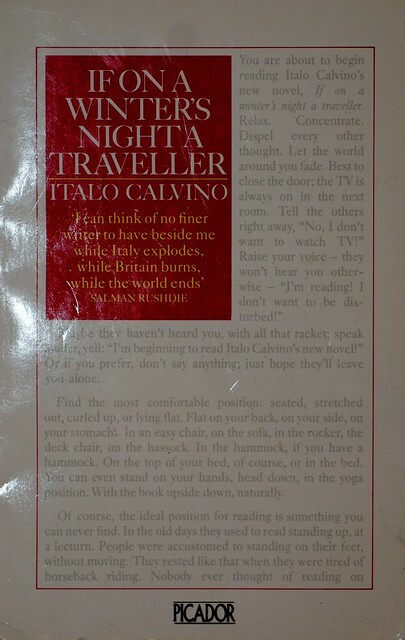 Italo Calvino, Jorge Luis Borges and Stanislaw Lem belong together. I suppose it is a little like decorating your flat with pictures from places where you have been and where you intend to go, and placing them in such a way that your mind can skip from one to the other as your eyes glide around the flat. Except you cannot take down a picture and then immediately go there again. E-books, needless to say, do not provide either effect. There are people who think you should not write in books. I am not one of them. I do it myself quite often (I never read non-fiction without a pencil in my hand, and I quite often make notes in fiction books, too -- though never yet in crayon), and I am delighted when I find it in second-hand books. 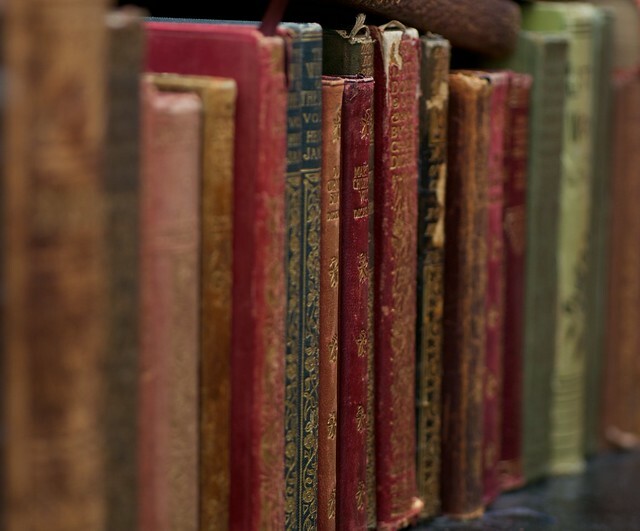 Books have history, and that history is an important part of them. In fact, I think it is perhaps the most important difference between the book and the digital file displayed on a screen. I once saw a first edition of Adam Smith's Wealth of Nations at the library of the University of Edinburgh, in which bored students in the 1800s had drawn quite obscene images in the margins, and later students had written comments to the images (and the text) and yet other students had commented on the comments and the images and the text. And so on. It was magnificent. You can do this with books. You can become part of their history (as much as they become part of yours). There is a reason why people would write the names of their family into their Bibles. But the history of books need not be written in crayon. The older they become, the more they accumulate what Walter Benjamin called "aura"*. This edition of Pepys is not very old (it was published in 1929), but it is old enough for me to treat it much more reverently than I would a Penguin paperback from 2000 (and not just because it is prettier). 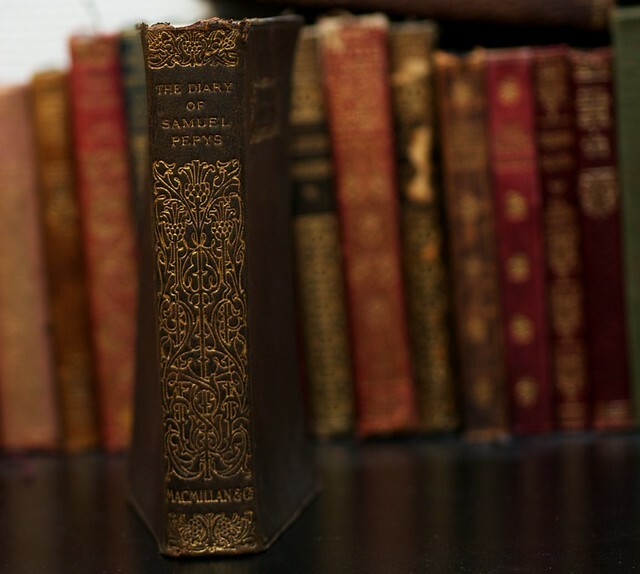 Old books, first editions, editions signed by the author -- we tend to treat all of these differently from other books. I don't think it is just me. It is their historical specificity, their individuality (perhaps), or their singularity (at least) which sets them apart. But all books share in this. I will now say something obvious. All books were new at one point. I think there is a tendency to think of books of today as commodities to be used and discarded. 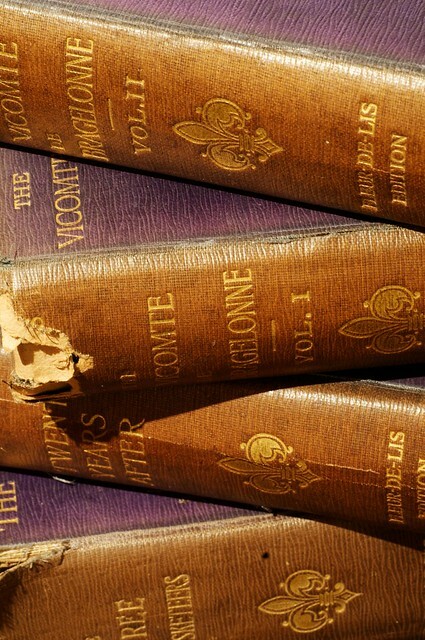 While old books, or first editions from the 60s are valued, current books are not. But they are the future objects of history. And the idea that a digital file can replace them makes me quite upset. 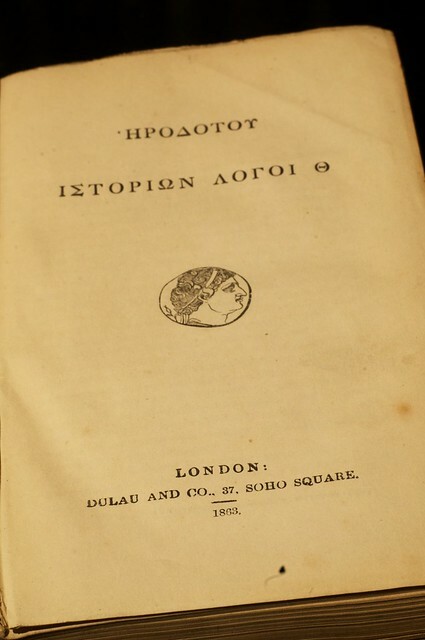 I have an edition of Herodotus' Histories in Greek. It was printed in Soho in 1863. 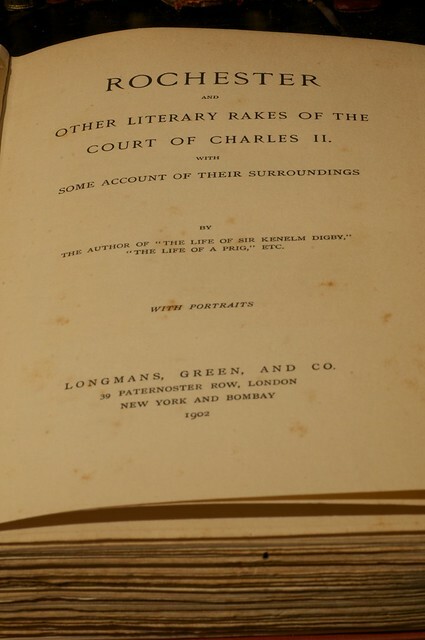 I have an edition of a book with the wonderful title Rochester and Other Literary Rakes of the Court of Charles II with some account of their surroundings, which contains a handwritten letter from the author to someone working in the Bodleian Library. I have stumbled across both these books in second-hand shops. They were not books I set out to find, and if I had just gone by the title, I would have been unlikely to buy either (although, to tell the truth, both would have been tempting). The reason why I bought both was their particularity, not primarily the text they could provide. They are of interest to me as book, and as historical objects; not only as texts. An e-book could not be either. I think it was my great grandfather's. 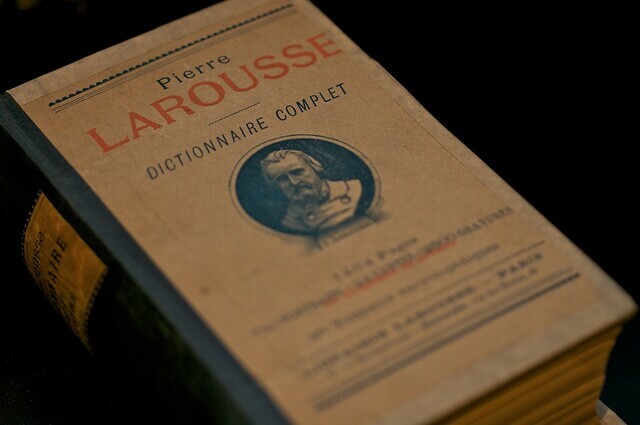 The Larousse is still very much in use, but it will be different from this book, both in content and appearance. 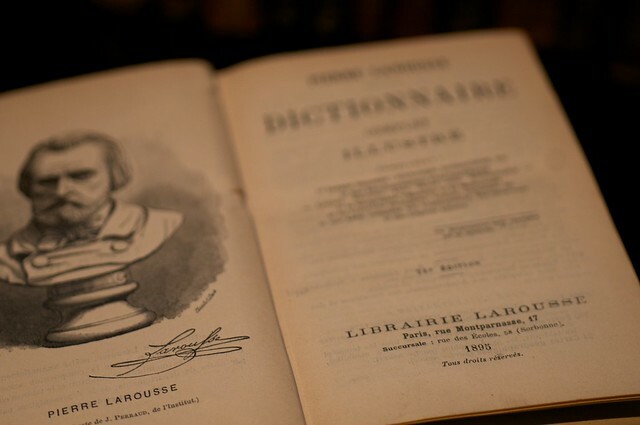 A dictionary from 1895 is different from a dictionary from 2012. I cannot imagine that digital editions will let us see the difference as they change. It is too easy to simply alter the file. Or delete it altogether. I will stop now. But I hope I have made it clear why I rescued this edition of Dumas' musketeer books from a box outside a shop in Edinburgh instead of simply downloading them from Project Gutenberg. *Benjamin discusses this concept primarily in his essay on "The Work of Art in the Age of its Technological Reproducibility". He did not properly discuss the book in that context (he only noted that the advent of the printing press was a special and important moment in the history of the aura), and I think that may have been because of the book's double nature as text and object: the printing press only allowed you to reproduce the text, while the book itself retained its historical specificity to some extent (although less than incunabula). The digital book, however … I shudder to think (although Benjamin might be quite excited). I completely agree. I enjoy the convenience of ebooks, like being able to take loads of them while traveling, but I dislike the fact that I can't keep them in my bookshelf, or easily lend them to someone. As Ulf said, yesterday, it would be excellent if you got a free download of the ebook whenever you bought a real book. In fact, we had this discussion about music a few years ago, with the controversy surrounding the "mp3 law", where the argument of the sensible people was that if you buy a CD, what you actually buy is the right to listen to that music, even if you choose to do so on an mp3 player. Unfortunately, it's somewhat more cumbersome to digitise a book than to create mp3s from a CD, so it would be great to get a free download. Also, may I say that the pictures are quite awsome. I especially like the one from the book market, and I'm quite annoyed I didn't take that picture myself. Kjempefin artikkel, Camilla! Og selv om jeg ikke er bibliofil, må jeg si meg helt enig. Det er ikke like kult å lese Anna Karenina på ipad'en, man får heller ikke like mye kred, når man f.eks leser noen sider på skolen mellom timene. Hva vet de om hvor mange titusenvis av sider jeg må kjempe meg gjennom. For alt de vet sitter jeg å surfer på vg.no. Grøss. Tor, en av pensumbøkene mine i juss hadde faktisk et kodekort bakerst i boka som gir en tilgang på boken på internett. Veldig greit. A really enjoyable read, this. I would like to mention Walter Benjamin's essay Unpacking my library. You, Camilla, have most likely read it, but I think Tor should read it as well. While fungal hallucinogens might be plausible in some rare cases, I feel confident that it more often is a cognitive and emotional response to the smell itself. I agree. It is a lovely essay. Du får ta med Bleak House og lese den foran dem. Inhalering av farlige sopper finner man også i arkiv, det er en av farene med jobbe, men vi arkivarer liker å leve farlig ;) Det blir ikke det samme den dagen vi skal begynne å rydde folks private digitale arkiv. Papir, og særlig gammelt papir lukter nydelig! Og jeg håper aldri vi ender opp i et papirløst samfunn! Siden dette virker mye som en tydeliggjøring av din side i frokostdiskusjonen vi førte i går, så må jeg bare nikke enig i det å kunne sette så enormt pris på objektet boken, som utvilsomt gir en merverdi utover selve teksten. Men jeg skulle gjerne lest en nyansert redegjørelse heller enn en ren kjærlighetserklæring. Eller kanskje en tilsvarende tekst dedikert til den nye teknologien. Nå var ikke dette en tekst om hvor mye du mislikte e-bøker, så jeg skal ikke bare mase mye om e-bok-argumenter her. Men mulighetene og potensialet i digitale bøker er mer enn bare enkle triks vedrørende organisering og søkbarhet. Det høres for eksempel helt fantastisk ut med en historiebok som kan oppdateres i sanntid (helst av et seriøst forlag, selvfølgelig), hvor revisjonshistorien ligger fritt tilgjengelig, mye på samme måte som i en Wikipedia-artikkel. Hvordan kan man enklere illustrere at historiefaget er en pågående diskurs, og ikke bare en opplisting av fakta? Eller aktuelle hendelser som fører til oppdaterte kapitler i samfunnsfagsboka? Jeg setter også pris på bøker som objekter, både nye og gamle. Men ta alle skolebøkene jeg brukte i grunnskolen og videregående, i tillegg til flere på universitetet: De er ikke interessante som objekter. De er en presentasjon av informasjon jeg gjerne skulle hatt tilgjengelig i det mest praktiske formatet tilgjengelig. De luktet ikke godt, de så ikke pene ut, og det var heller ikke mange tekstpassasjer som satte et varig inntrykk hos meg. De er uinteressante som objekter, i alle fall inntil vår (ganske nylig) sosialt konstruerte historiske fascinasjon gjør de interessante igjen som historiske objekter, dokumenter, om 30-40 år. Et eller annet sted ligger det noe om "miljøbevissthet" i dette også. Det trykkes og leses mye som ikke er eller kommer til å bli verneverdige klassikere. Jeg vil derfor oppmuntre til og omfavne den digitale utviklingen. Stolthet over bokhylla er bare simpel materialisme. Vakker, velduftene og atmosfæreskapende, men fortsatt materialisme. Jeg er veldig enig med Finn Arne. Etter å ha lest teksten din tenker jeg at du nettopp har argumentert for nettopp det at bøker [i]er[/i] verken bedre eller dårligere enn e-bøker, men heller helt forskjellige. Enig i at papirbøker er noe annet enn e-bøker, ikke bedre eller verre, men annerledes. Forøvrig kan man på en Kindle se understrekninger i teksten der mange andre i verden har valgt å sakse ut en passasje. Sikkert inspirert av de sporene du er så glad i å se i gamle bøker. På sikt vil kanskje hele verden dele et eksemplar av hver bok, og dele kommentarer og vittigheter akkurat som noen relativt sett få personer har gjort i eksemplene du viser frem. Men det jeg har problemer med er denne "like bra". Det er omtrent som å sidestille barnet ditt og en ostehøvel. A combination of grassy notes with a tang of acids and a hint of vanilla over an underlying mustiness.